WorkPilots brings the cash straight to your phone. Work Pilots makes finding gigs easier and faster than ever. Browse and apply for jobs with just a few clicks, earn money and show the world what you’re capable of. Do work only as much as you want and when you want. You can easily find a job near you without an education or previous work experience. We all need money, some need a lot of it, some less. Jobs, however, can be hard to find or fit into your schedule. This is what Work Pilots is for! It’s an application that brings short-term jobs and gigs straight to your mobile phone. We at Work Pilots want to offer job opportunities for youth, and why not for older folks as well, in the form of quick short-term jobs. 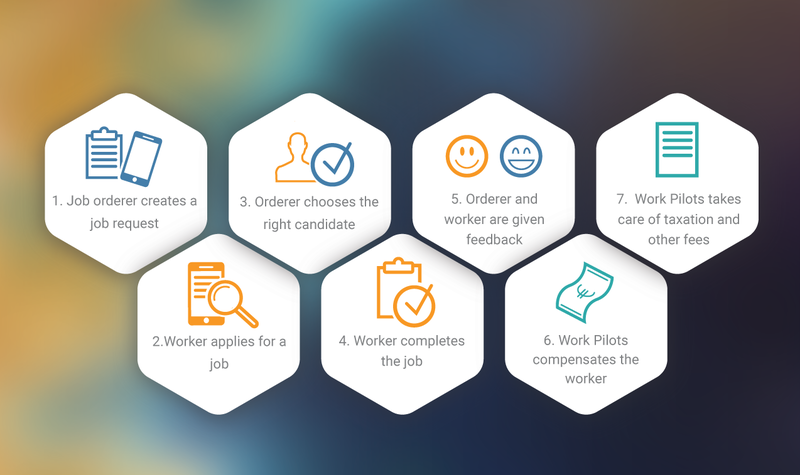 Whether you want to find a summer job, a part-time job while in school, or want to offer help during high seasons, Work Pilots is the app for you. Our application is downloadable for Android in Google Play Store, and for IOS in App Store, for free. You can also use the service on the web here. For every job, you are paid a fixed 10€ per hour and the application takes care of all the contracts and taxes for you. You will always get feedback from the person who hired you on your profile. All of your jobs are saved onto your profile so that you can easily use your job history as proof of your work experience. Great feedback brings additional value to your CV alongside your other accomplishments. Your profile is private and is visible only to those whose job offers you are applying for or have applied to. Download the app, explore the job openings and find your first job today! WHAT KIND OF JOBS CAN YOU DO THROUGH WORK PILOTS? Help with cleaning, doing grocery shopping, instructing on how to use computers or other devices or even just keeping a senior company. Taking care of the yard or garden, washing cars or carpets, taking out pets, shoveling snow – and many more. Moving out, moving in, carrying heavy stuff, anything that you need some extra help with. Even the person who offers work does not always know what they need. You can write down in your own profile what types of jobs you would be willing to do and hopefully give ideas to others. Short office work, moving furniture and other inside jobs. Work Pilots finds you suitable gigs nearby. You will get a notice straight to your phone and you can decide which jobs you apply. The intelligent technology, developed in Finland, prevents any misdemeanours and scams. Mutual feedback lets you see how other workers have previously graded the orderer. Work Pilots gives you the opportunity to make money and gather work experience when it’s convenient for you. Service is free to use for you. You will be paid from the work you do and will always get your money. The application even handles the advance tax for you.